Hello, I'm Gregor and I put this site together. 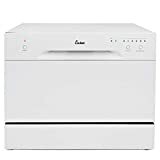 At first, you'll find an overview of recommended countertop dishwashers, followed by a public poll and a general buying guide on countertop dishwasher. 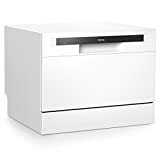 Further down on this page, we do link to other well-written articles and reviews about countertop dishwashers. At last, you'll be able to weight in your own opinion in the comments section. 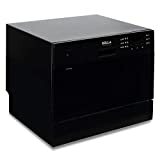 If you also want to vote on the best countertop dishwasher, click here to view the poll. If space is limited, but washing dishes by hand is just too much, a countertop dishwasher may be the perfect solution. Once considered an entry-level appliance, these small wonders now boast many of the same features as their full-sized counterpart. 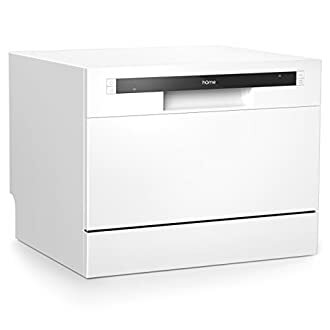 If you live in a small apartment, dorm or RV, here’s everything you need to know about the benefits of a countertop dishwasher and how to choose the perfect model for your home. Let’s clear up the terminology before getting started. Countertop and portable dishwashers are similar, but they’re not the same and the terms are not interchangeable. 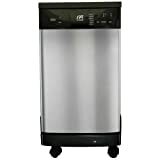 Both styles use a direct connection to the sink as a source of water, but portable dishwashers are much larger. 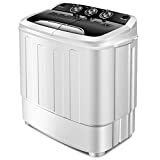 In fact, many are similar in size to many built-in models, but they come equipped with integrated wheels that help you roll it to the sink to use it and away for storage. Countertop models are about half the size. They’re designed to sit permanently on the countertop or can be stored in a cabinet between uses. No wheels are attached, but you always have the option of mounting it on a cart of your own to make it portable. How do countertop dishwashers work? Like full sized models, countertop dishwashers are just stainless steel tubs with heating elements and arms that spray water. The dishwashing features are much the same — only the way it uses and drains water is different. To install it requires only connection to a household portable source near your kitchen sink and two hoses. One connects the dishwasher to the sink via an adapter and that supplies the water. The other connects to the dishwasher and drains waste water into the sink. You will not be able to use your faucet while the dishwasher is in use. Portable dishwashers have obvious benefits, but a few may surprise you. Here are some to consider. 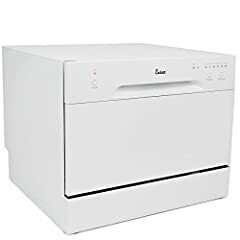 It takes longer for a dishwasher to wash, rinse and dry dishes than it takes for a couple of people to tackle the task by hand, but it frees you up to do more important and timely things. If your dishwasher has an automatic timer, the time savings increase exponentially by allowing you to wash dishes during off hours — even while you’re asleep. You or others in your family can use the shower or wash the car without worrying about the water supply drying up, helping you better manage your daily schedule. Conventional wisdom is that built-in dishwasher save water because of the large number of dishes they can wash simultaneously. So, does that hold true with countertop dishwashers? Absolutely! Dish for dish, countertop models use about the same amount of water regardless of the type of cycle and when compared to hand washing, researchers estimate that water savings can be as high as 30%. If you’re on a municipal water supply, you may not notice the difference, but if you’re on a well or depend on a portable water supply in your RV, the saving can be the difference between scarcity and plenty. Can a countertop dishwasher really help you be green? 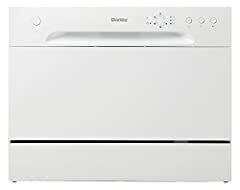 Today’s dishwashers, especially energy-star rated units are power misers, using significantly less energy when compared to the electricity used to generate the large the quantity of hot water needed to hand-wash dishes. To kill pathogens on dirty dishes, the water temperature must reach a scalding 140 degrees Fahrenheit, but the typical water heater is set only to 120 degrees to avoid burns from tap water. 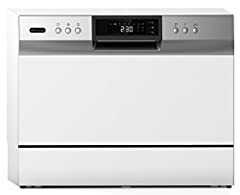 All dishwashers, including most countertop models, are made to exceed the 140 degree benchmark and the result is cleaner, more sanitary dishes. Plus, they can remain inside until they're put away, avoiding the dust and other debris that be a problem when drying in a dish rack. Countertop dishwashers all work the same way and there are few major design differences between brands. What set most models apart are its physical characteristic and convenience features. These are the important things to look for. Countertop dishwashers must be able to sit firmly on the chosen countertop. This means measuring your space to ensure the counter is both wide and deep enough to hold it securely while fitting under vertical cabinets. Most models are less than eighteen inches tall and fit most standard cabinetry configurations. 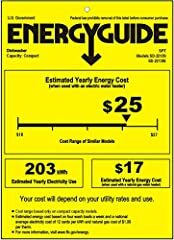 There are no vents to accommodate, it’s a fully self-contained unit, but you’ll need to make sure there’s space for the power cord, access and waste hoses. Although they’re well insulated, it may be possible to feel heat from the exterior and condensation is a rare, but potential problem. Consider this when choosing a space. Models range in weight from as little as thirty pounds to an average of forty to fifty, making them lightweight enough to move frequently. If the weight is too heavy, they can be put on rolling carts as long as they sit firmly on the surface and are not jostled while in use. Most countertop dishwashers hold four to six place settings worth of dishes — give or take a few. A few larger models can handle ten settings. They typically can’t accommodate pots and pans, but usually come with a removable rack for utensils. More important than capacity, however, may be the plate height it accommodates. Most handle ten to eleven inches, but just half an inch difference can make it unusable. Countertop dishwashers are self-contained in an insulated cabinet and the quality of that insulation determines how noisy it is. The good news is that most models are rated to produce somewhere between 45 and 55 decibels, a level that’s comparable to built-ins and is not considered by most to be disruptive. Hose typically come with quick change adapters that fit most standard faucets. If you have a specialty model, an additional adapter may be required. Pull-out faucets are usually not compatible. No models allow for connection to a garbage disposal. Common options include normal plus heavy-duty and water-saving cycles. If you need to sterilize baby bottles, look for model with a high heat cycle and for keeping the dishwasher clean, a rinse-only cycle is a plus. You may be out of luck when it comes to drying, however. Only a few models have a power-dry cycle, but with so few dishes, opening the door for a few minutes usually does the trick. - Stainless steel shows fingerprints. - Small dents show more on steel and black finishes. - Reflections show in shiny finishes and can make already tight spaces look smaller. - White is most likely to discolor, especially in direct sunlight. - Most countertop dishwashers can’t use pre-filled dishwasher pods, but most have a rinse agent feature. - Some models have timers that offer up to a twenty-four hour delay. - Empty the filter basket per manufacturer’s recommendations. - To prevent messy accidents in the event of a malfunction, put a thin absorbent towel under your dishwasher. 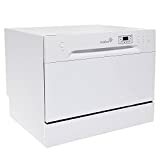 - If the dishwasher needs to drain water at a level higher than the unit itself, a model with a pump is needed. - Scrape off heavy food debris before putting dishes in the dishwasher and never let dishes obstruct the spray arm. - A bright, LED display is a plus. - Check the length of the hoses to make sure they will comfortably reach your faucet. Don’t let the technology scare you. Countertop dishwashers are easy to install and simple to use. Just measure your space carefully, check for faucet compatibility and decide on the features. Then place your order and make plans for what you’ll do in your spare time! New: Our editorial list of additional articles. 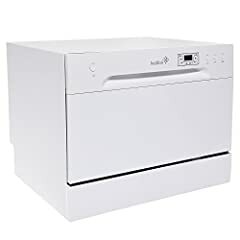 We decided to gather informartion all around the internet and present you a list of helpful, external links to interesting reads about the best countertop dishwashers and their reviews and guides. You're not convinced by the previous writings about countertop dishwashers? Of course you can just choose by visual impression, that's why we present you all our chosen products at a single glance. A click on any image is enough to open an external link to the best offer we could find. 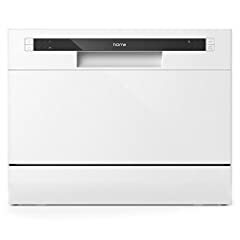 Finally, we want to present you our rating criteria for our countertop dishwasher comparison, so you can better understand and comprehend our recommendations and the rating process itself. 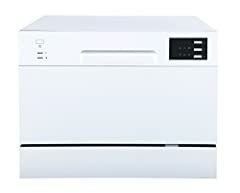 Furthermore, we still ask you to keep your eyes open for short term deals in order to make some great bargains with countertop dishwasher in 2019. Published by G. Krambs on StrawPoll.com (last update on 2019-04-18 08:36:20). 9 of 14 readers found this article helpful.